In New Zealand, it seems all you need to do is throw seeds at the wind for them to flourish, but elsewhere, apart from their native South America, a little more skill is required. I’m not a botanist, horticulturalist or soil scientist either but I hope that this information will point home growers in the right direction. See our Further reading page for books and other websites too. Feijoas are hardy and tolerant to temperature extremes from -7°C to 40°C. Flower production is poor in areas with fewer than 50 hours of chilling. Optimum number of chilling hours is 100-200. Feijoas prefer cool winters and moderate summers (25°C to 33°C). The flavour of the fruit is much better in cool areas. Without any pruning, the shrub may reach 4.6m (15 ft) high and 4.6m (15 ft) across. A healthy mature feijoa tree can produce around 200kg of fruit each season. 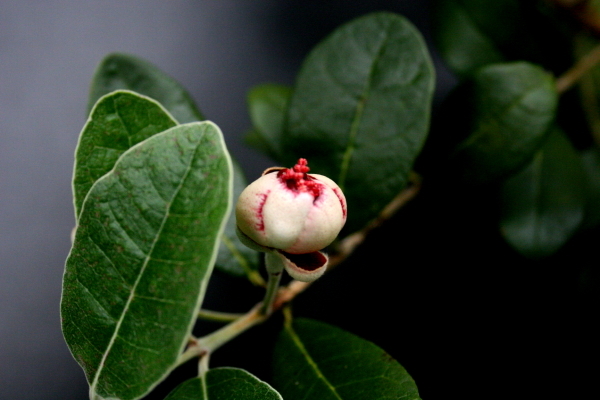 Some grafted cultivars of feijoa are self-fertile. Most are not, and require a pollinator. Some varieties of feijoa are known as self-fertile (meaning they don’t need pollination from another tree) but even these varieties are likely to bear more fruitfully if they are cross-pollinated. All others require two or more trees for successful pollination and fruit formation, but even then it may not pay to rely on birds or bees to carry this out. It depends on where you live. In case you’ve forgotten, pollination is the transfer of pollen from the male part of the flower to the female part of the flower. For feijoas, the pollen ideally comes from a different tree of a different variety in order to fertilise the plant and set the seeds or fruit. In New Zealand, the primary pollinators of feijoas are bees, bumblebees, and medium-sized birds. The silvereye is a pollinator in the cooler parts of the South Island; the blackbird and the Indian myna, which feed on the sweet, fleshy flower petals, are pollinators further north. In California, robins, mockingbirds, hummingbirds, starlings, scrub jays, towhees, and grey squirrels feast on the petals and are presumed to be assisting with pollination. Honeybees also visit the flowers. 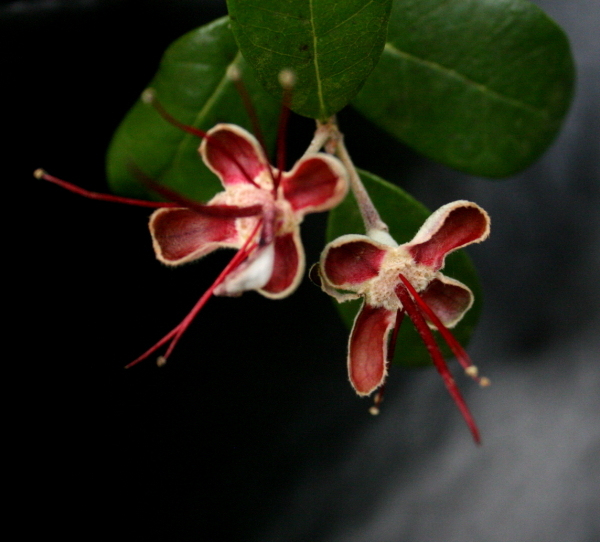 In Australia, honeyeaters and noisy mynas are known to feed on the feijoa flowers. Bees are rarely responsible for pollination. If your tree is too dense and the birds can’t get in to the flowers, then pollination may not be occurring, just one reason that your tree may not produce fruit. You can hand pollinate using a small natural fibre paint brush. Just dab the brush on the end of the stamen of one flower then repeat on another. Work your way around the tree a few times during the flowering period for a bumper crop. [From Barry’s Organic Gardening]. I’ve also picked flowers from neighbouring trees and brushed them across the flowers on my tree. You should hand pollinate every few days while the flowers are viable. Feijoa trees don’t transport well, so make sure you are planting them in a final spot. Choose the healthiest plant you can and ensure they are well fed through their early years. Watch out for the delicate feeder roots which are near the surface. Don’t dig around your feijoa and make sure they get a deep watering when needed. While the tree is renowned for its drought resistance, the fruit need a lot of water to set and can drop due to high temperatures and low water. Labels state that trees will fruit after three years, but some trees can take longer to mature. I’ve also read that if a tree does take longer to mature and fruit, then it is often a very heavy bearer as a result. So maybe leave it another year or two before you pull your tree out and try again. There is a lot of argument out there regarding seedlings versus grafted plants. I kind of sit on the fence as I’ve purchased two seedlings and one is growing well and the other, in identical conditions, has not done as well. If it fails, I will replace it with a named grafted cultivar, one that flowers at a similar time to the one that is doing well. Seedlings are sold in nurseries (and Bunnings, I hear) under the label acca sellowiana. They do not have any variety name such as Mammoth or Unique (please see our ever growing list of named cultivars.) They can be slower to fruit and are often used as ornamental or hedging plants. In support of growing seedlings successfully, I’ve had a wonderful response from Leon Wilson (read his comment under places to buy quality feijoa trees) who has grown 240 trees in Western Sydney as part of a 15-year research project. He has great tips for getting trees to produce. Elsewhere, I find forums littered with comments from people whose trees have not flourished, not flowered and not fruited. The response is uniform: they have most likely purchased a seedling and will do much better if they try a grafted named cultivar. Most feijoa trees offered for sale have been cutting-grown from commercially proven parents and you can expect quality fruit within three to four years. 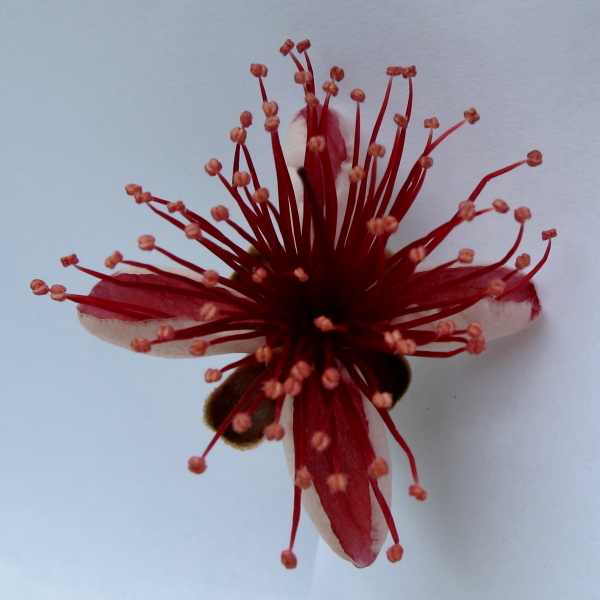 However cheaper seedling plants sold as feijoa sellowiana are still available. Avoid them if you are after large fruits in just a few years. The seedlings may not produce fruit for years and then the fruit quality and size will be variable. Seedlings are fine to plant if you requite a hardy ornamental hedge with the fruit as a bonus but you will be very disappointed if you plant seedlings for fruit production. The cultivars are more difficult to grow, I understand, but once they flourish the fruit has recognisable and reliable characteristics… that means they will produce fruit that is true to form. They are more expensive and only available through specialised fruit tree nurseries. Because they generally do not produce fruit until the third year feijoas only need a small amount of fertiliser placed around individual trees in the first three years. However in the fourth and subsequent years the trees bear more fruit and so require higher levels of fertiliser. It has also been suggested that rotted animal manure applied in autumn can increase yield. The feijoa is a heavy feeder. Feed with high nitrogen NPK fertiliser in late winter and well rotted animal manure in autumn. 200g of fertiliser per year of tree up to 10 years and 2kg per tree annually thereafter. Do not put fresh manure on to trees as it can burn the roots. An excessive amount of nitrogen can encourage the trees to grow vegetatively, producing more leaves and shoots rather than flowers and fruit. Therefore if nitrogen is low it may be best to apply it between August and December (southern hemisphere), before flowering begins. Nitrogen-heavy fertilisers can cause potassium deficiency and fruit cannot form. Potash and seaweed solution is often recommended. Water – there is no magical volume. You need to read your local climate, water deep when required and ensure that the plants don’t get stressed. Chilling hours – it’s a reality that feijoa plants require 50-100 hours of cold or chill to set the fruit. Their natural climate is temperate highlands, so they simply do not fruit in warmer or really cold climates. Nitrogen – most plants need nitrogen, however, nitrogen causes excessive vegetative growth and can result in a potassium deficiency causing fruit to drop. Read the labels and avoid N-based fertiliser around fruit production time. The main pests of feijoas include leafroller, mealybug, hard wax scale, greedy scale, fruit fly and Australian guava moth. 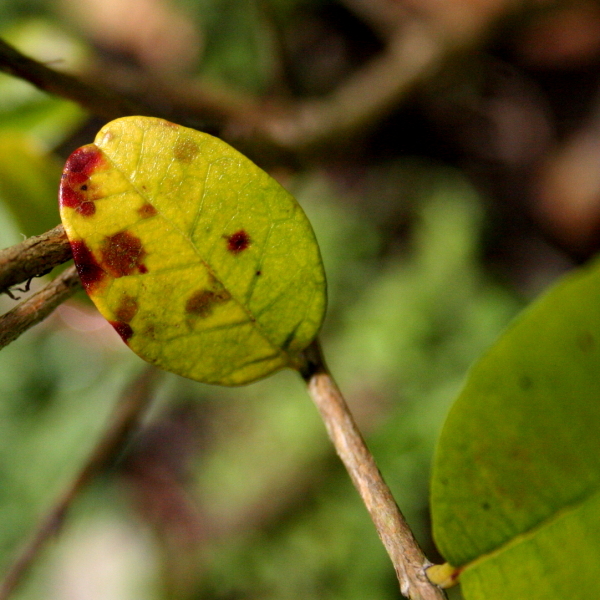 The fruit fly and guava moth attack the fruit, while the others do not cause significant damage but in large numbers may reduce yields by damaging leaves and growing shoots. Sooty moulds are fungi which cover plant leaves, stems and twigs in a black sticky substance. In almost all cases, the sooty mould is secondary to an infestation of insects that secrete honeydew. These insects include aphids, scale, mealybugs and white flies. Treating the insects will remove the source of the honeydew and dry up the sooty mould, which will eventually fall or wash off the foliage. The mould itself does not feed on the plant, however as it covers the leaf surface, it is blocking light and reducing photosynthesis, essential for plant growth. That information came from the Yates Australia website and I have found two sprays of Yates Pest Oil to be successful with my sooty mould. White oil has also been recommended, which you can buy from a garden centre or make your own from vegetable oil and liquid soap. Guava moth lay their eggs at the stem and style end and in cracks and crevices on fruit. The resulting larva feed inside the fruits, causing premature fruit drop. Pupation occurs in loose soil and ground debris. 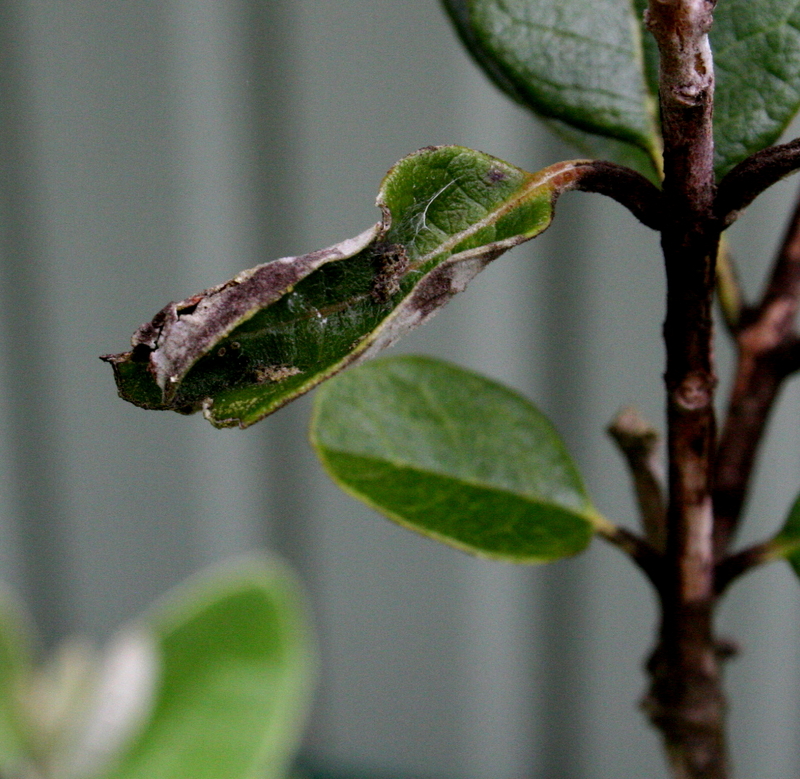 Guava moth damage may affect the productivity of a garden feijoa tree and the gardener may notice a hole in the fruit with frass (insect droppings) at the entrance. Guava moth infestation is obvious once the fruit is opened as the flesh will be brown and rotting. Pheromone traps are available which are designed to catch adult guava moths. That information came from New Zealand Garden Science who confirm that these moths are now a problem in the north of New Zealand, as well as Australia. This photo shows some of the damage from a leafroller, the larvae of certain moths. I just pick the whole leaf off as soon as I see them as there aren’t that many on my small tree. This is caused by soil pathogens. Rub the base of the tree and if the bark comes away, you may need to treat with a copper fungicide. More often these trees do not come back but you will need to treat the soil as well before you can replant in the same place. Feijoas respond well to pruning and can be trained to a small tree with a single trunk or pruned to form a dense hedge or screen. They can even be espaliered. Carry out pruning in late autumn or early winter, shaping the tree and thinning out inner branches so that light and birds can reach the fruit next season. 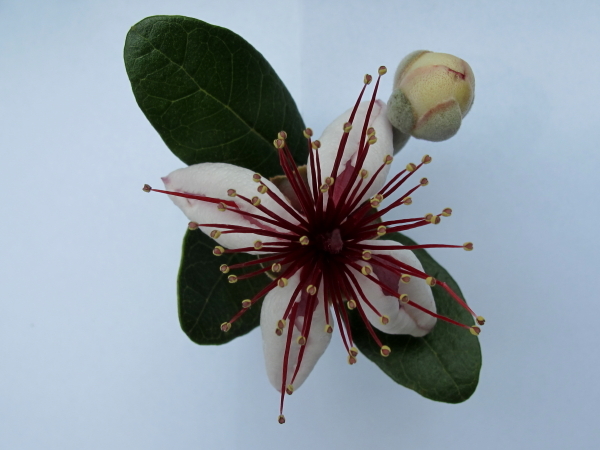 A great guide to pruning feijoa trees can be found on the ehow website. I was wondering if you have any idea (or could find out) what weight the largest Feijoa recorded has been. I have regularly found fruit at over 250 grams but many are only 100 gram or smaller. Hi I chop up whole feijoa and freeze it sucessfully. I use this in baking and fruit puddings. personally I wouldnt freeze whole fruit, you would be left with a globe of mush. I am a feijoa lover living in Melbourne. I just got back from NZ and literally ever second house has or knows someone with a tree. They are lush and produce massive juicy fruit. I have seen lots of trees in Melbourne but the fruit is small and usually drop off before the get too big.I have grown a couple of trees and pampered them and some years get nice big fruit. This year i had a few but most fell off too soon. Edible but unsatisfying. I think the chill hours are the problem in Melbourne as it is with most fruit grow here. I am also a grape lover & imported some ‘Albany Surprise’ canes. They have done really well here. Anyway my question was what can you do to get your fruit to stay on the tree a bit longer. More water in the Summer? protection from the heat & wind? more nutrients ? Hi, I have 2 feijoa trees and have had them for 3 years. One of them has lost all of its leaves. It’s never happened before and I’m not sure if its dead or not. It flowered last summer for the first time to. IF FEIJOAS ARE GROWN IN ABUNDANCE IN N.Z ETC WHY AR,NT EXPORTED IN ABUNDANCE TO ENGLAND ETC WHERE IT,S DIFFICULT TO BUY THEM IF AT ALL. THEY ARE THE BEST FRUIT I,VE EVER TASTED. Hi Lori, feijoas have soft skin and soft flesh and don’t travel too well. After five or so days the inside starts to oxidise and go brown and the flavour is lost. As far as I am aware they can’t be frozen for weeks/months like apples etc. Perhaps the genetic modifiers will fix that one day, but for now feijoas are truly seasonal and truly fresh off the tree. There are companies in the UK importing and distributing feijoa juice and other products, so you could get a taste fix that way. Thanks for stopping by. Hi Juliana, Feijoas freeze really well. I’m in the Waikato and freeze them – they stay in the freezer for up to 2 years so far and taste as good as fresh ones. That is just the pulp. Tried the whole fruit but skin went all mushy. Daphne. Hi Danielle, how far south are you? I know feijoa trees can grow in the cold (Scotland even!) but not fruit. They need their ideal conditions to produce fruit and as far as I know you can’t hurry them along even when that’s met. Two metre high should be mature enough to fruit, but it may be too cold, you may need that extra tree for cross pollination, or (scratching my head) the soil may be depleted and they may need more water/more fertiliser/more minerals. I’m going to revisit and edit this page so it’s clearer what is needed. I am not really a growing expert either… just working on accumulating greater knowledge. Levan, if you mean 6 thousand kg, then that is indeed a lot of fijoa. Fijoa juice makes a delicious fruit wine, which should be easier to sell than the raw juice. How did fijoa trees make their way to Georgia? Hi, I live in South Africa. My dad has had a feijoa tree in his garden for many years. We used to call it a fruitsalad tree. His fruits are more brown and fluffy, similar to a kiwi fruit. I’d like to propagate one for my garden, as we dont get the trees here. Will it work with cuttings? Will i need 2 trees for cross pollination? He only has the 1 which does bear fruit. Thanks. Anthea. Hi, I’m in Melbourne and have two feijoa trees that were fruiting nicely last year but the fruit got knocked off in the Christmas day storms. This year the flowers aren’t opening fully (kind of half way) and are then just drying up. Does anyone know why this might be happening? My first thoughts are not enough water but I’m not sure as I have been watering them. Hey there, in truth I am not proving to be a great feijoa grower so I am not entirely sure what will help your tree. Some varieties are small, of course, and differ from the supersized ones favoured by the commercial growers. However, as they are known to be heavy feeders, you could try more water and/or more fertiliser. Perhaps the soil has become depleted? The trick is not to apply a nitrogen-based fertiliser as it causes the fruit to drop. Old fashioned manure is often recommended… I am using an organic pelletised fertiliser here as I can’t get the stuff recommended by growers and the tree has really sprung into life. But mine are small young trees. Good luck. At least you have fruit :) enjoy the chutney making!! I’m Mr.parviz Ilyasov from Azerbaijan. manager of the Agricultural company. http://www.ikar-s.az Many years we also grow some local feijoe avrieties. For us interesting your countries local varieties…is there i can find some trees for commercial planting. i can buy more than 200 000 trees which is ready for planting…..
Hi Parviz, I really don’t know where you would get 200,000 trees but I will create a post about your request and see if some of the growers here in Australia and also in New Zealand can respond. It’s a very interesting request and I would love to know more if it came about. I’ll put a post up soon. Hi Juliana, I live in Chfristchurch and have a feijoa tree about 15 years old but would like to ideally shift it now to another position on our property… is this possible? I am not sure on the variety but it has been a good cropper, altho 50% of the fruit is small. No problems with diseases or mites of any sort. Hi Maxine, I’ve been told never try to move them as the roots are sensitive. And I’ve seen the question posed in other forums but never heard of a successful move. My feeling is if you could dig and lift masses of soil around the root ball of a much smaller tree you could do it without traumatising the roots. But I’m imagining that a 15 year old tree is quite large! I’m guessing not too many people have to move their feijoa trees, but I’ll post a question and see if anyone responds. Thanks for dropping by, sorry I can’t offer more advice at the moment. How many days of cold treatment in a refrigerator do feijoa seeds need before germination? Or will they germinate immediately after planting in a suitable seed raising mix, without prior cold treatment? Hi Walter, I’m sorry but I don’t know anything about growing from seeds and I haven’t seen this mentioned on any of the feijoas sites I’ve visited so far. I imagine books like Thorp and Bieleski’s Feijoas: Origins, Cultivation and Uses may have this information. The New Zealand Feijoa Grower’s Association sells this publication for delivery in New Zealand. However, there are growers who visit this site and if I ask the question of the community, maybe we can get an answer back from those experienced in growing seedlings. Let me try at least, as the information is missing from my growing page. Hello Walter. I brought some seeds back to Southern England taken from fruit I ate in N.Z. in May 2009. I simply sowed them in general purpose compost on a windowsill at normal room temperature. I didn’t pre-fridge them but they all germinated. I gave about 20 away and planted 2 in my garden. They are doing well and have made 5 ft high x 4ft spread. I live in hope of getting some fruit ! You know I am just someone who EATS and LOVES them, don’t you? Not a horticulturalist. I have one tree that is seriously losing leaves while the other mere metres away is doing fine. I’ve been recommended to trim mine back and boost the organic fertilisers – but I certainly am not in the salt and wind. I’m going to look at ways to get specific growing problems like yours in front of expert growers… and add to the feijoa-growing wisdom here. It’s one area I need to increase my knowledge of and it would be great to share. Sorry I can’t be of help straight away. We are in the north right by the coast, and both my neighbour and I have a feijoa hedge. I have the same problem as you and think it may be caused by poor drainage as our neighbours hedge is just fine. The only difference seems to be theirs is planted beside a drain – same soil type and conditions otherwise but we have had a VERY wet winter. Am going to install drainage and see what happens. Sue, I have not seen white spots (I struggle with sooty mould related to scale – and it’s black) but I have seen others asking about it in forums. No answers though. Do you have a good photo? Can I post it on this site with a request for information and hopefully one of the experts who pass through here might be able to help? Let me know if you want to try that and I’ll give you my email addy. I have a lot of feijoa in my garden, i’m from Georgia (it’s a country). in my garden there are about 250 trees and every year i have about 6.000 kg feijoa. I have too many territory and I’m going to cultivate 5000 new young plant for next year, but I afraid that I can sell it. I don’t know if anybody use feijoa juice (concentrates). Please help me about this issue which companies are buying this concentrates (I can also to do juice, such is apple or other), or please tell me what product will be best for market from feijoa? P.S. our feijoa has one of the best composition and it is very delicious.